Björk blooms her most impressive album in a good while with Utopia, featuring co-production by Arca and even a guest spot by Rabit, who both aid in buoying her astonishingly lush and romantic new song cycle. 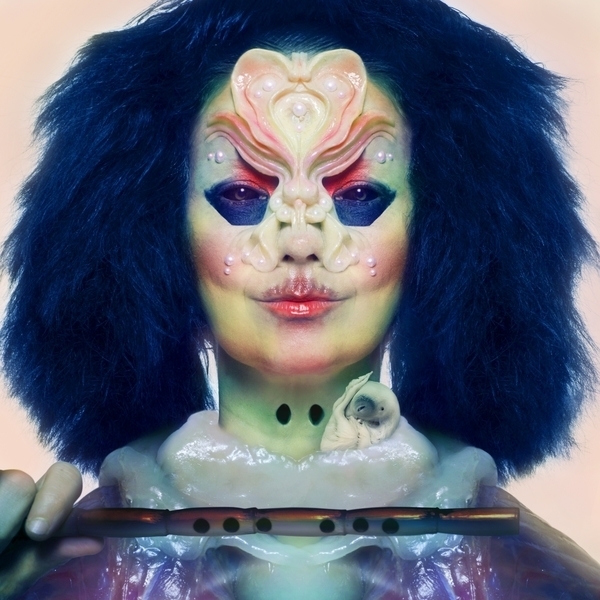 As sincerely optimistic as the title may suggest, Utopia is, by Björk’s own description, her “tinder album”, projecting a positive answer to the tortuous soul-searching of Vulnicura. We can take or leave a lot of Björk on most days. But this one got us right thurrr. Whether that’s due to the seamless integration of Arca’s virtuosic flourishes, it’s difficult to say. However, the embrace of space and nature, both real and emulated, within Utopia lends an intoxicatingly out-of-body sensation to its songs which beautifully leavens her sometimes overwrought delivery, serving to free up her spirit in the most literal and fascinatingly intangible terms. Where Arca was brought in at the late stages of Vulnicura to warp its edges, their working relationship immediately spilled over into the recording of Utopia, forging a symbiotic and hugely fruitful relationship with the artist he formerly called his idol. Now creative partners, their powers are multiplied, manifesting the longest single piece of work in either’s catalogue, and arguably their most seductive. You can literally hear her beaming while she sings over swooping subs, gamer FX and pirouetting harps in Awakening My Senses, whilst the folk phrasing and prettiness of Blissing Me perfectly counters her operatic tendencies. Conversely, the adroit looseness of Arca’s rhythms acutely mirror the expressive meter of Björk’s classical inflections in Body Memory, one of the album’s longest, most immersive highlights, and equally in sweetly fractious form to giddy effect on Losss, which benefits from Rabit’s push ’n pull production. And even when talking frankly about the darker side of that tinder life in the couplet of Courtship and Sue Me, she pulls off delirious, rugged - but not overbearing - rhythms and skyward-zipping flutes keeping her spirit decidedly up and forward-looking in a way that also informs the album’s heart-cupping conclusion, Future Forever. Back in stock! 6 Panel Digipak with poster and 12 page booklet.